By themselves, musky jerkbaits are nothing more than painted wood (or plastic) and steel, with little or no built-in action. But on the line of an experienced angler, that same jerkbait can be pure magic. As effective as jerkbaits can be, they tend to be misunderstood. If you use them on days when muskies want a faster presentation, they can actually cost you fish. 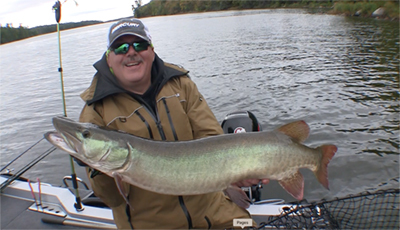 Jerkbaits are at their best when muskies are relatively unaggressive, when a bucktail or topwater buzzing over the fishes’ heads won’t draw a second look. 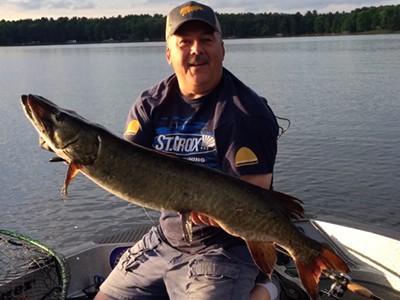 On those days, a sluggish musky can find a jerkbait’s darting, start-and-stop action difficult to resist. 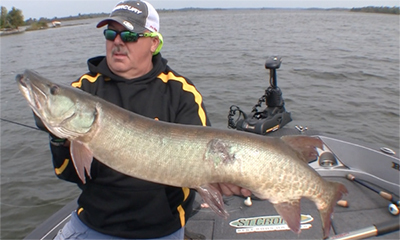 When muskies are less than aggressive, a jerkbait can work wonders. Note the 10-inch Suick to the left of author Steve Heiting. A jerkbait is fished by twitching or pulling the bait with the rod through the water — rather than jerking. As the bait ends its forward motion, quickly move the rod tip back toward the bait to create slack line to allow the lure to complete its full action. While you are moving the rod tip back toward the bait, be sure to reel up the slack line to maintain contact with the lure. Allowing enough slack to enable the lure to move properly yet controlling the slack is a delicate balance that must be mastered. Because of the slack line, a musky strike often won’t feel like much more than a “tick,” so it’s best to set the hook on anything that feels different. While many anglers pull jerkbaits by snapping the rod downward between their legs, I find I have more control over the lure, get better action from it, and maintain a better hookset position by holding my rod at about a 30- to 45-degree angle toward the water and pulling the rod tip to the side with wrist snaps. For gliders, I use a heavy action, 7-foot-6 rod with a stiff wire leader, specifically St. Croix’s Legend Tournament “The Jerk.” For divers, I use an 8-foot-6 or 9-foot heavy action rod in St. Croix’s Legend Elite series, with a fluorocarbon leader. I don’t use a fluoro leader for gliders because the wider, flexible material will drag in the water and diminish the bait’s action. No-stretch, braided line made of Spectra and testing 80- or 100-pound test is mandatory. There are only two styles of jerkbaits — divers, like Suicks and Bobbies; and gliders, like Reef Hawgs, Hellhounds and Phantoms, among others. A diver jerkbait dives when the line is pulled and rises during a pause; whereas a glider darts to the side, up or down when pulled, and suspends or sinks slowly in between pulls. To truly become an effective jerkbait fisherman, it’s best to focus on only one or two models of jerkbaits in each style, and learn everything you can about them. For years, jerkbaits were made only of wood and the lures’ actions were affected by the density of the wood, over which the manufacturer had little control. Today, some like the Suick HI (High Impact), Hellhound and Phantom are made of solid plastic, which yields consistent action from lure to lure. However, while a wooden bait may sometimes be untunable, every now and then one will produce an action that is irresistible to muskies and is impossible to replicate. If you have such a lure you probably wouldn’t trade it for your buddy’s truck. Divers can be tuned by bending the tail — a straighter angle allows for a deeper dive, whereas a pronounced bend will yield a shallower dive and choppy action. If the bait favors one side, bend the screw eye (line tie) one way or the other until it runs the way you want it. It’s smart to “T” the hooks on the bait’s belly to minimize hook wear, regardless of jerkbait style. Finally, if the hooks on your bait are not attached with split rings, cut off the old hooks and replace them with new ones attached with rings. While this may slightly hinder a bait’s action, the better hooking capabilities more than make up for it. When the situation or the muskies call for a diver, the first bait out of my tackle box will probably be a Suick because I can do so much with the action. I can make a well-tuned bait dive in the direction I want so I can steer it in an out of cabbage or around rocks, and with a wrist snap I can make it flop on its side or back and expose its belly to the sky. Still, there are times when the wider head of the Bobbie is more advantageous, such as when bumping it in and out of still-green coontail in early fall, or when casting to suspended muskies, when the fat head creates more drag and thus more wobble while the bait is rising. Among gliders, my first pick is usually a Hellhound or Phantom because their plastic construction allows me to fish them fast, dart them just under the surface, or dive off a weed edge. However, the wider head of a big, slowly-twitched Reef Hawg creates more water movement, which can trigger a lunker musky looking for a quick, belly-filling meal. Adding weight to a wooden jerkbait can make it much more versatile. Pre-made, screw-in weight systems available at many tackle shops allow an angler to fish the bait without weight, or to add up to an ounce to its belly. Almost all jerkbaits balance about an inch behind the front hook, so place the threaded insert there. On a diver, extra weight will gain depth and create more hangtime during pauses in the retrieve, while on a glider the extra weight will allow you to fish the lure faster while maintaining depth, or much more deeply by counting it down before beginning the retrieve. 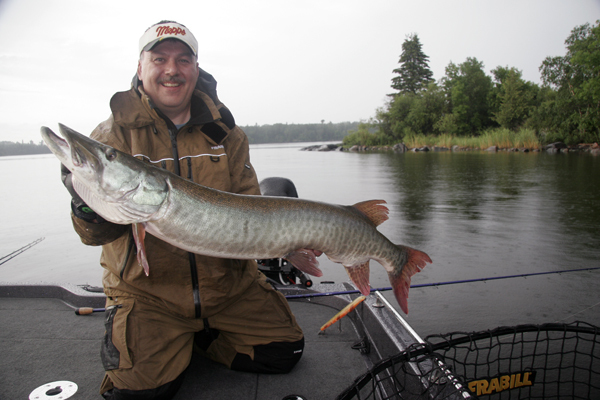 I always try to fish as fast as conditions allow in the belief that by contacting more active muskies, I’ll catch more. 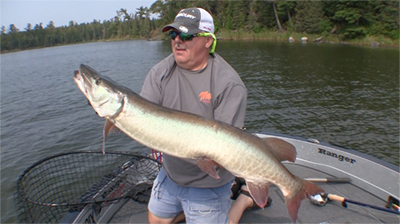 Still, the days when muskies are aggressive are rare, and that’s why jerkbaits demand space in your tackle box. Fish them right and unleash their magic.